So what is the key to a successful year? If you ask me, it’s all about classroom management. I start the year off strong by making sure students really know the expectations and routines of my classroom. I spend a lot of time practicing, role playing, and reviewing expectations. I use to assume that by third or fourth grade the students knew the expectations on school rules or how to use a pencil sharpener – then I discovered if you don’t go over YOUR way, they really won’t know. One of the fun ways that I like to go over school rules (and break the ice a bit) is through my causation cards. These are interactive cards that gets each student up individually to “perform” an action related to their speaking part. Typically the speaking part is related to content – but in this set of cards, it’s related to the rules. For instance, looking below – these are cards number 2 and 10. The writing in red is the last two words the previous student read off. The part in green is the actions this student would take. The part in black text is the words the student would read off. Students have to listen carefully to each student to know when it is their turn. Additionally, my kids have always enjoyed being able to “race” through the cards as fast as they can and beat their previous time. These cards are not time consuming and children just absolutely love them. They typically remember the action associated with a concept later at test time. With all the hype around Common Core, this a great way to build fluency along with those listening and speaking skills. Further, research has shown that students learn best when action is associated with learning- brain based learning- right? And well… it’s just plain fun! Want your own set? I guarantee your class will LOVE it and want to do these activities more often! Click on the picture below to download it for FREE! Thanks for organizing this fabulous back to school blog hop! I love your rule cards….what a great idea! Looking forward to visiting the other sites! Thanks for hosting such a great blog hop, it's sure to be great! I love how you think classroom management is such a big factor in a successful school year – I definitely agree! Thank you, Tammy, for giving me the opportunity to participate in this blog hop! 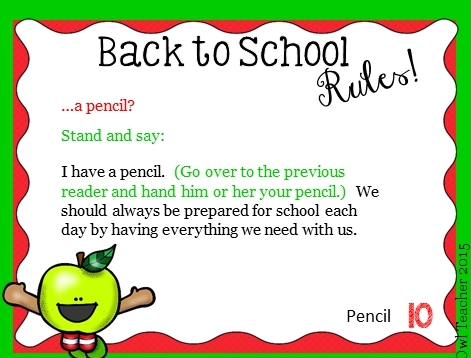 You're so right about the year going more smoothly if you teach rules and procedures first. It's so important for my kindergarten kids. I think students of all ages really get into moving, and the color coding is a really terrific idea! Thanks for hosting this awesome blog hop! I love your cards! Thank you for hosting this awesome hop, Tammy! I loved linking up and can't wait to hop through all of the different posts!! It was so fun sharing ideas! THANK YOU!!! Thank you so much for hosting and preparing such a wonderful blog hop!!! You are trully amazing!!! I love your Causation Cards! Thank you for being so generous! Thanks Tammy for taking the time to put together this blog hop. I also love your causation cards. Such a great idea. I had so much fun cruising through such great BTS tips! Thank you for hosting!